Once Upon a Learning Adventure: Introducing...me! I cannot believe that my mind is already in Back to School mode! It is way too early! I think it must be all the school supplies sneaking their way into my favorite stores! I may or may not have already made three trips to the Target Dollar Spot for some goodies...shh!! Anyways, after seeing some adorable Meet the Teacher books on Pinterest, I just knew I had to make my own for the first day of school! So, I thought I'd share it with you all, of course! 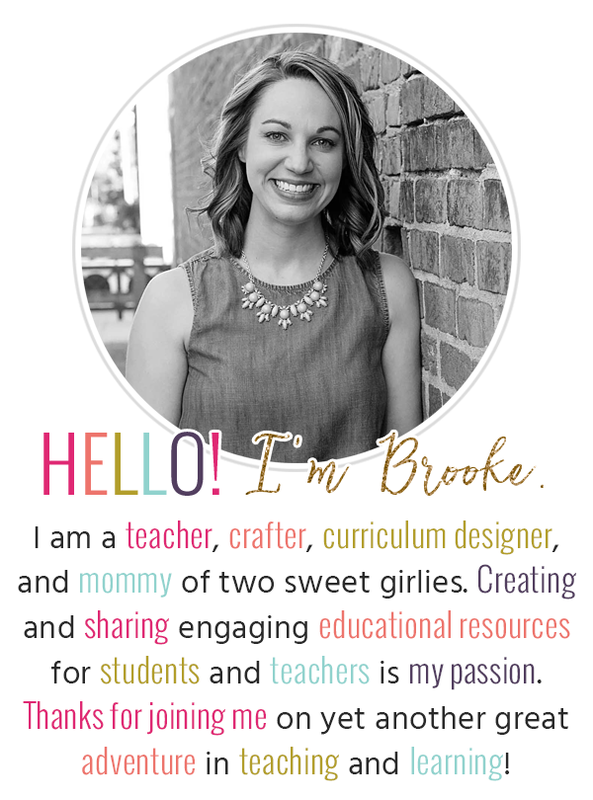 I think it turned out really cute, and I hope you (and my new students) will enjoy learning a little bit about me! Now all I need to do is get it printed, bound, and on my bookshelf for the first day! If you would like to make your own All About the Teacher Book, I've created an Editable Template for Powerpoint. Click the link below to check it out! Oh, and the first two people to comment can have one for free if you leave me your email! Thanks for reading, and have a great rest of the day! I'm off to do some sanding and painting...my diy is taking a bit longer than planned...hope to share it with you soon! I love love it! So cute! This is darling! Love the colors! This is great! I love the bright colors! I've been planning to do this for awhile, but wasn't sure where to start. I love this! I've been wanting to make one, would love to use your template! That is a cute way for the students to get to know their teacher! Thanks for posting. Thanks for sharing this. It's super cute! Your students will LOVE this! They get such a kick out of peeking into the life of their teacher! Oh my goodness! I love this idea! You did a great job! I just started following your blog and glad I am! If you have time check out my blog and see if there are freebies that you might like! Oh I just bought that same digital paper this week! So cute! I loooove it when someone else does the hard work for me! So precious! It's in my cart! This is so cute! I just finished making an All About Teacher Big Book to use with my pre-k kiddos on the first day of school! Wish I had seen your template before I started! What a great idea! Thanks for sharing it with us! Come stop by my 100 follower giveaway! I love this idea..i am definately getting it! Love This! So cute... One more thing to add to the "make it list" ! Love it! Can't wait to make one! What font did you use for your name on the cover and the black font that you used throughout the book? Thanks so much! I love this idea!! I am so borrowing this it!! Your "All About Me" is adorable. I hope you pinned it to Pinterest. I can see several teachers I would with wanting something like this. I am now a follower. Thanks for the great idea. Love this! Where did you get the cute font?! I have GOT to have this! LOVE it!!!! I LOVE this! I just got some new digital backgrounds in my classroom theme! I would love to make a book like this for my kiddos! Please check out my blog and see the shot out I gave you!!! Thank you for such an awesome idea!!! Oh my gosh! That is soooo very cute. I am a new follower and am thrilled to have found your blog. I would love it if you would link up on my "Blogs of Inspiration" page. LOL! I'm never the first few comments no matter how hard I try! I read blogs on my iphone on mobile RSS feed app and you can't reply back to comments- or at least I haven't figured out how to. I have to get on the old fashion desktop computer to do that! IF you know how to comment on RSS feed let me know! This is such a great idea! If you get a chance, stop by my blog and enter for my giveaway. I am giving away 3 $10 gift certificates to Tpt for back to school. Good luck! Awesome idea im love this! Shavonne.cook10@gmail.com. Amazing Blog its good to stubble upon inspiring AND FUN .. HAVE TO ADD FUN blogs like yours! That's priceless! 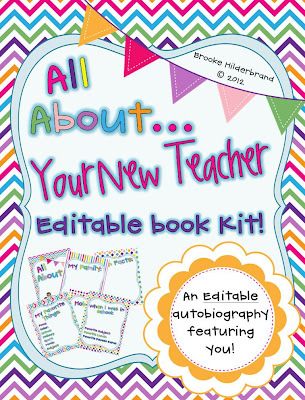 Fun for the kids and the parents will love that you're their child's teacher! This is a really great idea! I am hopefully going to be starting my first year of teaching next month and was looking for ideas for my first few weeks of teaching ... especially since Im super nervous about it! Thank you for the great idea! Just ran across this and your template matches my classroom theme! Would LOVE to use it with your permission? LOVE you blog!!! Thank you!! Very Cool! Would love a copy please. Me too! There is no link and I would Love to have this! Hi Brooke! I am a long term sub who will be taking over a kindergarten class next week. I LOVE the idea of sharing an "All About Mrs. T" book with them but don't see the link to get to the editable power point. Can you please provide guidance? Thanks! Inspiring! I really liked it. It gave me many ideas for my first class at the U. Thanks. I'd love a copy of this!! how adorable!!! I love this! How can I get a copy of the template?